It can take days for water to travel from a filtration plant to your tap and the length of time the journey takes could affect water quality. Disinfectants from water treatment, like chlorine, prevent the growth of harmful microbes, but they can break down over time, creating toxic byproducts in the process. Minimizing the water’s travel time in pipes reduces both processes, but measuring that time is difficult. 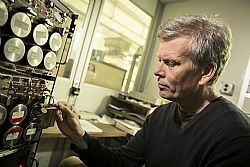 UWM scientist Jim Waples and an interdisciplinary research team have found a new method of finding the age of water at any point in a distribution system using something that’s already naturally in water: residual radioactive atoms from nuclear fallout of the 1950s and early ’60s. The researchers hope their dating method will lead to new insight into the factors that affect drinking water quality in the nearly 2,000 miles of water mains in Milwaukee and other distribution networks around the world.